From left: Luben Ron García, Lucy Crespo, and Dr. Horacio Serrano. Changing the mentality of researchers and scientists to dare to market their ideas, while inserting as early as possible into the education system of Puerto Rico are vital factors for the economic transformation of the island, according to the participants of the panel “Collaboration between the Industry and the Academy for Innovation” held this past weekend as part of the Annual Conference of the Puerto Rican Society of Microbiology. “We do not have enough small and medium-sized companies focused on science and technology, and they are the ones that move the economy,” said Lucy Crespo, chief executive officer of the Puerto Rico Science, Technology and Research Trust, and one of the panelists. “We have to transform the culture and spirit of knowledge to one of commercialization,” she said. To achieve this, “scientists have to dare” and seek advice from entities to help them get their ideas across. “We fall in love with our ideas, they are like our babies, but perhaps it is not attractive to our market, and we do not know it. And you must dare to ask for help,” said Crespo, who took the opportunity to list the various programs Trust has which are focused on fostering innovation such as Parallel 18 and the Office of Technology Transfer. Luben Ron García, general manager of OMICS Global Solutions, emphasized that one of the competitive advantages of Puerto Rico to develop its scientific economy is the extraordinary human capital the Island has, “but you have to believe in it,” said García, who is from Venezuela. In addition, he stressed the importance of retired professionals must continue to contribute to the scientific and economic development of Puerto Rico. García, along with the medical director of OMICS Dr. Horacio Serrano, who is also a professor at the University of Puerto Rico, presented his company as an example of collaboration. OMICS currently develops a product to help doctors make a better forecast for Type 2 diabetic patients. Both executives explained that they evaluated places like Dominican Republic and the city of Miami to establish their company, but they decided for Puerto Rico because of the human capital and the solid scientific infrastructure the Island enjoys. “The collaboration with the Trust has been crucial for the development of our company,” Serrano said. 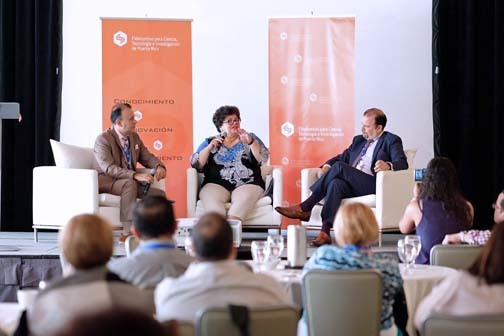 According to the panelists, to strengthen innovation in Puerto Rico, it is important to work on an academic curriculum review that will allow students to learn from an early age aspects of management, administration, and entrepreneurship in all sectors — agricultural, industrial and biotechnological, among others. “You have to teach them to be bosses and not employees, to create a generation of students who want to do R&D (research and development) and at the same time start their own companies to sell those ideas,” the experts said. Hey Buddy!, I found this information for you: "Panel: Commercializing innovation key to PR economy". Here is the website link: https://newsismybusiness.com/commercializing-innovation-economy/. Thank you.